Three Voyager 2 images, taken through ultraviolet, violet and green filters, were combined to make this photograph. The Voyager 1 and 2 Saturn encounters occurred nine months apart, in November 1980 and August 1981. Voyager 1 is leaving the solar system. Voyager 2 completed its encounter with Uranus in January 1986 and with Neptune in August 1989, and is now also en route out of the solar system. 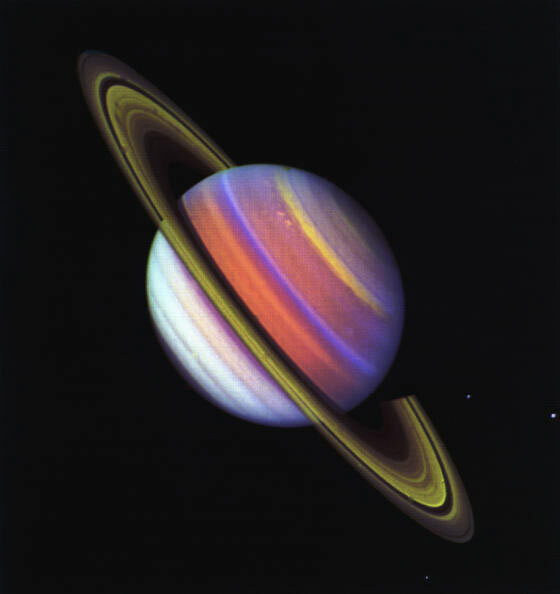 The two Saturn encounters increased our knowledge and altered our understanding of Saturn. The extended, close-range observations provided high-resolution data far different from the picture assembled during centuries of Earth-based studies. Subdued contrasts and color differences on Saturn could be a result of more horizontal mixing or less production of localized colors than in Jupiter's atmosphere. While Voyager 1 saw few markings, Voyager 2's more sensitive cameras saw many: Long-lived ovals, tilted features in east-west shear zones, and others similar to, but generally smaller than, on Jupiter. Winds blow at high speeds in Saturn. Near the equator, the Voyagers measured winds about 500 meters a second (1,100 miles an hour). The wind blows mostly in an easterly direction. Strongest winds are found near the equator, and velocity falls off uniformly at higher latitudes. At latitudes greater than 35 degrees, winds alternate east and west as latitude increases. Marked dominance of eastward jet streams indicates that winds are not confined to the cloud layer, but must extend inward at least 2,000 kilometers (1,200 miles). Furthermore, measurements by Voyager 2 showing a striking north-south symmetry that leads some scientists to suggest the winds may extend from north to south through the interior of the planet. 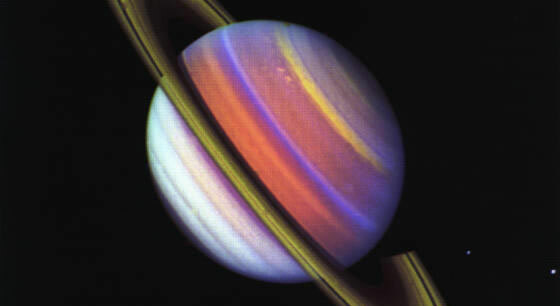 While Voyager 2 was behind Saturn, its radio beam penetrated the upper atmosphere, and measured temperature and density. Minimum temperatures of 82 Kelvins (-312 degrees Fahrenheit) were found at the 70-millibar level (surface pressure on Earth is 1,000 millibars). The temperature increased to 143 Kelvins (-202 degrees Fahrenheit) at the deepest levels probed - - about 1,200 millibars. Near the north pole temperatures were about 10 degrees Celsius (18 degrees Fahrenheit) colder at 100 millibars than at mid-latitudes. The difference may be seasonal. The Voyagers found aurora-like ultraviolet emissions of hydrogen at mid-latitudes in the atmosphere, and auroras at polar latitudes (above 65 degrees). The high-level auroral activity may lead to formation of complex hydrocarbon molecules that are carried toward the equator. The mid-latitude auroras, which occur only in sunlit regions, remain a puzzle, since bombardment by electrons and ions, known to cause auroras on Earth, occurs primarily at high latitudes. Both Voyagers measured the rotation of Saturn (the length of a day) at 10 hours, 39 minutes, 24 seconds.